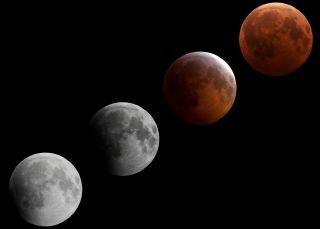 Robert Vanderbei captured this montage of the total lunar eclipse of Dec. 21, 2010. As with all lunar eclipses, the region of visibility for Sunday's blood-moon lunar eclipse will encompass more than half of our planet. Nearly 1 billion people in the Western Hemisphere, nearly 1.5 billion throughout much of Europe and Africa and perhaps another 500 million in western Asia will be able to watch as the Harvest Full Moon becomes a shadow of its former self and morphs into a glowing coppery ball. The Sept. 27 event is therefore being called a "supermoon eclipse." The last such eclipse happened in 1982, and the next won't occur until 2033. This graphic shows the areas of the Earth where viewers will see the lunar eclipse of Sept. 28, 2015, including much of North America, South America, Africa and Europe. Almost everyone in the Americas and Western Europe will have a beautiful view of this eclipse. The moon will be high in a dark evening sky as viewed from most of the United States and Canada while most people are still awake. The only problematic area will be in the Western United States and West-Central Canada, where the first partial stage of the eclipse will already be underway when the moonrises and the sun sets on that final Sunday in September. But if you have an open view low to the east, even this situation will only add to the drama, for as twilight fades, these far-Westerners will see the shadow-bitten moon coming into stark view low above the landscape. And by late twilight, observers will have a fine view of the totally eclipsed lunar disk glowing red and dim low in the eastern sky. Alaskans will also see the moon rise during the eclipse; much of eastern Alaska will see the moon rise while immersed in the Earth's shadow. For Hawaiians, moonrise unfortunately comes after the end of totality, with the moon gradually ascending in the sky and its gradual emergence from the shadow readily visible. Western Europe and Africa also will get a good view of the eclipse, but at a less convenient time: before dawn on Monday morning (Sept. 28). The eclipse will actually begin when the moon enters the faint outer portion, or penumbra, of the Earth's shadow. The penumbra, however, is all but invisible to the eye until the moon becomes deeply immersed in it. Sharp-eyed viewers may get their first glimpse of the penumbra as a delicate shading on the left part of the moon's disk about 15 minutes before the start of the partial eclipse (when the round edge of the central shadow, or umbra, first touches the moon's left edge). During the partial eclipse, the penumbra should be readily visible as a dusky border to the dark umbral shadow. The moon will enter Earth’s much darker umbral shadow at 1:07 a.m. on Sept. 28 by Greenwich, or Universal time, which is 9:07 p.m. on Sept. 27 in the Eastern time zone, 8:07 p.m. Central time, 7:07 p.m. Mountain time and 6:07 p.m. Pacific time (before moonrise). Sixty-four minutes later, the moon is entirely within the shadow, and sails on within it for 72 minutes until it begins to find its way out at the lower left (southeastern) edge. The moon will be free of the umbra by 9:27 p.m. Pacific time or 12:27 a.m. (Sept. 28) Eastern time. The vaguer shading of the inner penumbra can continue to be readily detected for perhaps another 15 minutes or so after the end of umbral eclipse. Thus, the whole experience ends toward 1 a.m. for the East (with the re-brightened moon now sloping down along the arc it describes across the sky) or during the mid-evening hours for the West. For Europe and Africa, the midpoint of this eclipse occurs roughly between midnight and dawn on Sept. 28, and the moon will therefore still be well placed in the western sky. At the moment of mid-totality (2:48 a.m. GMT), the moon will be directly overhead from a point in the Atlantic Ocean a couple of hundred miles to the north of Belém, Brazil. Below we present a timetable of the key phases of the eclipse. Times in p.m. are for the calendar date of Sept. 27; those in a.m. are for Sept. 28. This timetable for the supermoon total lunar eclipse of 2015 lists the times of major events for the Sept. 27-28 lunar eclipse by time zone. You can use this guide to know when the eclipse will start in your city. In Europe, most countries currently observe "summer time," in which clocks are either one hour ahead of Greenwich time (London, Lisbon) or two hours ahead (Paris, Rome). For the Canadian Maritime provinces, clocks run one hour ahead of Eastern time, except in Newfoundland, where it's one and a half hours ahead. Notable cities in the Eastern time zone include New York, Jacksonville, Florida and Atlanta; in the Central time zone, Chicago, Memphis, Tennessee, and Houston; for Mountain time, Salt Lake City, Denver and Albuquerque, New Mexico, and in the Pacific Time Zone, Seattle, San Francisco and Los Angeles. In the United States, Daylight Saving Time is not observed in Arizona. Clocks there read similar to Pacific time. For most of Alaska, clocks run one hour behind Pacific time; in Hawaii two hours. Editor's note: If you capture an amazing view of the supermoon lunar eclipse or any other night sky view that you would like to share with Space.com for a possible story or gallery, send images and comments to managing editor Tariq Malik at spacephotos@space.com. Joe Rao serves as an instructor and guest lecturer at New York's Hayden Planetarium. He writes about astronomy for Natural History magazine, the Farmer's Almanac and other publications, and he is also an on-camera meteorologist for News 12 Westchester, New York. Follow us @Spacedotcom, Facebook or Google+. Originally published on Space.com.